Sri Lankan woman who co-founded the Janashakthi Bank, a self-help micro-credit development movement in her destitute war-torn area. This self-help development movement later spread nationwide. Later after a spell staying at Hemyock Castle while studying, Mrs. Prem led the very successful Prem&apos;s Village Fund initiative to help survivors of the 2004 Asian Tsunami in her area of Southern Sri Lanka, to restart & rebuild their lives. Mrs. Prem lived at Hemyock Castle during parts of the 1990s and 2000s. She was a remarkable woman. She was from the Hambantota District of Southern Sri Lanka and became friendly with the Sheppard family during Margaret Sheppard&apos;s voluntary work with the Women&apos;s Development Federation / Janashakthi Bank in Hambantota District. Mrs. Prem had started what became the Janashakthi Bank in Godawaya, the small Sri Lankan fishing village where she lived. When she moved there as a teenage bride in the 1960s, the houses were built mostly of mud with coconut thatch roofs, without running water or basic facilities. This was during terrible civil unrest throughout the country: Following independence, the new government regime was establishing the Singhalese Socialist Republic. Singhala language was imposed in the schools and Singhalese culture was promoted. Teaching of English was stopped. But Singhalese neighbour turned against Singhalese neighbour; in a society where co-operation was needed to survive: eg. When thatch roofs were blown off in storms, help was needed from neighbours to replace them; also, fishing in the small oru canoes was a co-operative enterprise – building and repairing the boats, crewing them and hauling in the nets etc. During these terrible times, neighbours turned on neighbours. Homesteads were set on fire, kidnappings and murders were common, rice paddyfields went uncultivated, fishermen could not put to sea as there was no one to assist with pulling in the nets or help to haul in the boats. Starvation, crippling debts (most families were in debt to money lenders), and poverty was widespread. Mrs. Prem related hair-raising stories of this terrible largely unreported period: Such as sitting in the dark at night to avoid the attention of political extremists who would "visit" to "recruit" teenaged sons; sending her children to safety in other parts of the country; starvation; suspicion of neighbours; and poverty due to the civil unrest. There was no overseas aid to the Singhalese, because the country was deemed a pariah state due to the civil war between the Singhalese and Tamils who were demanding a homeland: The Tamils were more likely to speak English, and many had obtained influential positions overseas, so the outside world listened much more to them. Instead of giving up (by this time she had five young children) Mrs. Prem decided it was time for self-help action. She gathered together other women of the village, ignoring the differences of caste and politics amongst their husbands. She formed the women into groups of five (one woman from each household). These groups met together frequently and helped each other, regardless of their husbands&apos; political allegiances. They organized weekly communal savings (5 or 10 rupees each per week). When they had enough they would buy items wholesale eg. a sack of rice, soap and other necessary household items which they would then share out. They helped each other with household repairs and fetching water from the communal stand pipes which were often far away. As these self-help groups developed they formed themselves into a village meeting of about 50 women who then undertook work projects at each others homes eg. building toilets to improve hygiene, house repairs including making bricks etc. As a pressure group they organized the installation of communal stand pipes throughout the village, even digging the trenches themselves. With their wives co-operating, the husbands followed and assisted in these projects. As more and more savings were collected through the 5-groups, these needed to be kept securely. A member with a bigger house supplied a room, and a daughter with A-levels kept the accounts; banking all the groups&apos; savings at a commercial bank. Over the next few years this became the Janashakthi Bank – a social micro-credit bank providing small loans for emergencies and development to members. eg. These small loans were usually about 5000 rupees. They were eg. to buy a fishing net to enable the member&apos;s fishing labourer husband to earn a greater share of the catch, thereby giving them a surplus of fish over daily needs that could be sold for savings; or to help start a micro business etc. There was a very high success rate for repaying these loans: Within each 5-group, all the other members of that group guaranteed each other&apos;s loans and the other women in that 5-group helped resolve problems which otherwise could well have led to default on the loans. Also, members realised that repaying loans enabled other members to benefit. Many members had previously been in debt to money-lending loan sharks; now they had fair access to credit in times of emergency, and the opportunity to improve their lives. The members started a pre-school, as previously most of these Janashakthi members&apos; children had dropped out of school. They had talks on family planning, looking after disabled children, (who previously were often hidden in the house), family health and hygiene, how to start and run small businesses, etc. 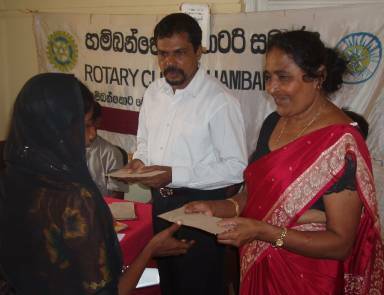 This successful self-help women&apos;s movement in Godawaya was noticed by the Government Agent in Hambantota. He visited Godawaya and decided to help the Janashakthi members to spread the idea to the rest of Hambantota District. Mrs. Prem and the other founder members travelled throughout Hambantota District holding village meetings to introduce their ideas to other poor villages. These were dangerous times and they were often at risk when holding these meetings in hostile areas. By the late 1980s this Godawaya model had been adopted as a blueprint. It is now nationwide under different names and this is Mrs. Prem&apos;s legacy. Mrs. Prem first came to visit the Sheppard family in 1996, for two weeks. She actually stayed for the maximum 6 months permitted by her visa. When she came she could not speak any English because English lessons had been abolished in the schools when she was a student, and there were few opportunities in her Hambantota District to learn this necessary international language. Captain Sheppard coached her with initial English. To improve her skills, she volunteered at Hemyock&apos;s Cameo Club, and made many friends in the area. Mrs. Prem had decided to attend Somerset College to learn more, and when she returned late in 1998 she became a student. The tutor encouraged the students to improve their English by working part time... suggesting bar work. But as Mrs. Prem was a Buddhist this was not suitable, so she became a part-time Ward Assistant at Musgrove Park NHS Hospital. She greatly enjoyed undertaking and passing the NHS NVQ training. Over the years she lived in Hemyock, Mrs. Prem made many friends in the area, so when she had problems obtaining a new visa, they rallied around her and the Home Office was eventually persuaded to change its mind. This enabled her to complete her studies at Bridgwater College where she obtained Merit in the Diploma in Business Studies. As permitted by her visa, she continued to work part-time at Musgrove Park NHS Hospital, where she was greatly respected. While Mrs. Prem was back in Sri Lanka awaiting her new Student visa for Bridgwater College, the terrible Asian Tsunami struck on Boxing Day 2004. This led to terrible loss of life in Hambantota District and much of the development progress made by the Janashakthi members was swept away by the four enormous waves. Their houses were destroyed, rice paddyfields were flooded with salt water, fishing boats and nets were destroyed. In Hambantota Town, the weekly seaside market was taking place. Many members had stalls or were shopping, so were amongst the thousands drowned or the many more who were injured. Many were missing for days and many bodies were never found. The generous people of Hemyock quickly rallied around, as did many others who Mrs. Prem had met in Devon & Somerset. Contributions poured in and Prem&apos;s Village Fund was formed. 100&percnt; of the donations were used to relieve the destitution and destruction; no money from donations was used to pay for administration or any other costs. Due to the Janashakthi structure of self-help and mutual group support rather than dependency, the Janashakthi members were able to recover economically very quickly as they did not sit around awaiting aid, unlike many of their richer countrymen. The contributions to Prem&apos;s Village Fund were distributed fairly, in small amounts such as: Fishing Net pieces that groups of members could stitch together to form a communal fishing net to restart fishing; small grants to restock or restart small village shops; small grants to start micro businesses eg. to buy a bicycle to enable a trader to take their fish to inland customers; dried fish projects; sewing machines to start dressmaking businesses etc. etc. Having touched the lives of so many people, Mrs Prem died in 2015.